Garcia returned to the school yesterday following his presence there last Friday in response to the disclosure that some students, supported by criminal elements, were planning to stage a gun attack and even kill a teacher and other students. The Minister was in Tobago until Monday evening where he hosted the final sessions of the national consultation on education. In making the visit to the central school again yesterday, the Minister wanted to ensure the suggested ramping up of security was in place and working, and he also wanted to continue discussions with the Principal, teachers and other personnel on the way forward. 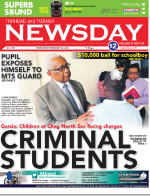 Two teenagers of the Chaguanas North Secondary School appeared in court on Monday and yesterday charged with threatening to kill a security guard and threatening to physically harm a teacher. The two teen boys are alleged to have threatened their female authority figures last week prompting classes to be dismissed early when school officials received information of a planned gun attack by gang members with close links to students attending the school. Last Friday, one of the teens, a 14-year-old Third Form student of the school, appeared in court charged with obscene language. He was then denied bail by Magistrate Wendy-Ann Doughdeen-Bally and ordered to return to court on Monday. He pleaded not guilty then to the charge. On Monday the teen, with his mother, was informed that additional charges were laid against him. The charges were using threatening language and assault by threatening to kill a female security guard. The teen pleaded guilty to the three offences and was granted $5,000 bail. He was ordered to return to court on March 1. The magistrate also ordered that a probation officers report be submitted before she sentenced the teen. Yesterday, a schoolmate of the 14-year-old appeared before Doughdeen-Bally and pleaded guilty to threatening to inflict grievous bodily harm against his geography teacher. The fifth former was granted $10,000 bail and a probation report was also ordered before sentencing is handed down. He is to reappear in court on March 8.